If you don’t know by now, your gut is essential for your health. It’s essential for happy hormones, fertility, energy, immunity, mental stability and SO much more. Basically your digestion is a BIG deal. 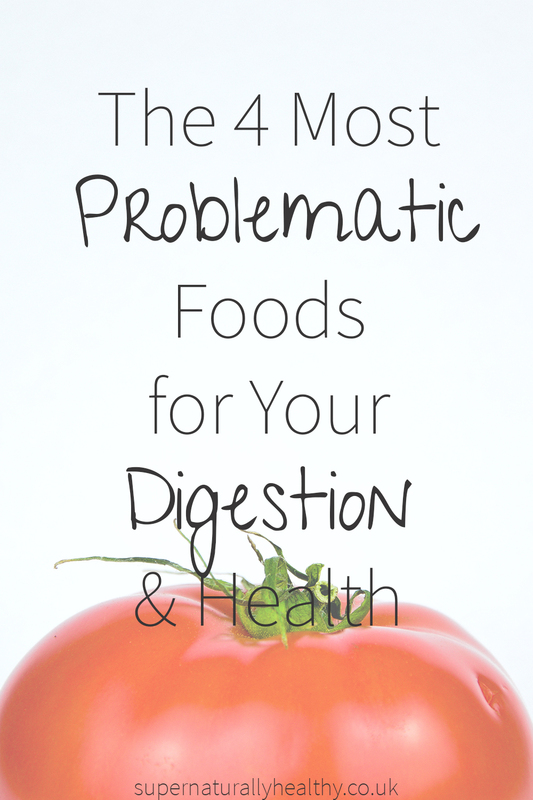 So in this blog we are going to look at the foods that are most likely to be doing your digestion more harm than good. These are the four foods that I see with my one-to-one client work, in my own life, and also from the clinical research out there that are the most problematic for most people (bear in mind everyone is different and any food can irritate your digestion these are the most common). They can irritate your gut and can cause bloating, IBS, bowel issues, skin issues, hormone imbalance, and all sort of not-fun things. Of course, all bodies are different and unique. This isn’t a formula for every single person! This is just a couple of patterns I’ve seen in my work, but remember every single person and body is different and whole point of the work I do is to help you listen to YOUR body not just follow a formula. The first food is actually two things combined into one: wheat and gluten. Just to be clear, wheat is a form of grain, and gluten is a form of protein that’s in lots of grains (including wheat). Let’s focus on wheat first. Well, right now you might be thinking to yourself, “Gosh, wheat’s in bread and we’ve been eating bread for thousands of years! Surely, it can’t be harmful to your digestion!” Well, wheat is food that is sometimes called a FODMAP, (which, for the insatiably curious, stands for “Fermentable Oligosaccharides, Disaccharides, Monosaccharides and Polyols” – say that five times fast!) Wheat is a high FODMAP food, and there is evidence that they can irritate your gut. If you have digestive issues, trying starting off by going 30 days wheat-free and see if you feel better (make sure it’s at least 14 days). A lot of my clients feel better right off the bat cutting out wheat. Gluten is a protein, a glue that holds things together in breads, cakes, and pastries. Again, everyone is different, but I’d say around 90% of my clients say they feel SO much better from not eating gluten. Gluten containing food is highly processed. There is a lot GMO activity around gluten-containing products and how they’re processed because they’re big money-makers in the food industry. Again, eliminating gluten isn’t a blanket recommendation for everyone, but if you’re having digestion problems, you can try removing wheat first for 30 days, see how you feel, then maybe a month later try removing gluten. If your gut is damaged or inflamed, especially your epithelial cell lining of your gut is damaged at all, then gluten-containing products can be irritating to digestion. There is research around having a low-level immune response to gluten even if we’re not allergic or have Celiac’s disease, which is quite serious and something else entirely. So just experiment, take your time, and see what your body says. If you go 30 days without wheat, or gluten, and feel no difference, then that’s fine! We’re all different. Now some of you might want to throw tomatoes at me just for saying this (and I am right there with you – I used to run a coffee shop if you’ll believe it), coffee can actually be irritating to some people’s digestion. If I drank coffee every day, my own digestion system would be in shreds. Coffee is highly acidic, plus you get a caffeine surge that can cause cramping or diarrhoea. It’s also incredibly dehydrating. And all that, for some people, can be overwhelming to their gut. Now for some of you, the solution might just be as simple as switching to decaffeinated coffee. You can go for the Swiss Water method or even try switching to tea – green tea is awesome for you. So if you have IBS, cramps, diarrhoea, bloating, etc., try taking coffee out of your diet for 5-7 days and see if it makes a difference. Feel awesome drinking coffee? Go ahead, have a cup a day! Otherwise, experiment and see what your body likes and what makes you feel good. Coffee can cause your blood sugar to drop, which will make you crave more sweet things. This means the amount of glucose that is in your blood at any given time will be going up and down and up down like a roller coaster. This can make you moody and lethargic, it can make you put on weight more easily, and it can honestly just cause a lot of havoc. With my own clients in our first session together, we always start right off talking about balancing blood sugar. It’s really important. If you really struggle with having enough energy throughout the day, and you’re using coffee as your crutch, which could also be contributing to different issues, especially around your adrenals. This is a big issue in our society – about 60% of my one-to-one clients have some level of adrenal dysfunction, especially women. Watch your coffee intake, and again – listen to your body! Try out of the ideas above and see if it makes a positive impact on your digestive system and how you feel. Now this one is particularly trendy right now. It seems like everyone’s dairy-free at the moment and on almond milk, or coconut milk, or soya milk, or hazelnut milk. Dairy, for a LOT of people, can irritate their gut lining or some people are allergic to lactose, which is a sugar contained within dairy, and some people just cannot produce the enzyme to process it properly. Others are reacting to the casein, which is a protein in dairy. So if you’r not reacting to lactose then you could be reacting to the casein. But don’t get me wrong, dairy is a great source of nutrition and if you don’t have a problem with it then please don’t restrict it for restrictions sake. It’s got lots of fat-soluble vitamins and protein but all these nutrients are a bit useless if you can’t digestion them. And if they don’t get digested then they can end up in your blood stream and cause havoc because lactose is not meant to be swimming around your blood. Signs that dairy is not your friend include skin issues like eczema, psoriasis, acne, random rashes, rosacea and frequent diarrhea can also be a sign. If you have any of these issues, try taking dairy out of your diet for 30 days and see if you feel better. The most common type of dairy that people are intolerant to is normal milk they may totally be able to process butter and cheese because those things have a lower lactose content due to how the dairy ferments and matures during production. Sugar feeds the bad, nasty bacteria that could be in your digestive system causing it to grow and have babies.…kinda. Now, we actually do want lots of bacteria in our digestive system. We just want the right types of bacteria. Often, too much refined and processed sugars will feed the bad, or pathogenic, bacteria. And this bad bacteria can ‘take over’ and suppress the good bacteria. So in order to support digestion we can reduce the number of refined sugars we take in to starve out the bad bacteria and allow the good ones to rule the roost again! I have a whole x2 completely naturally sweet and sugar-free recipes ebooks which you can find here. And in my Flourish Academy community online I have sugar-reduced or sugar-free yummy recipes. Together, we can create some good sugar-free habits! Wheat and Gluten, Coffee, Dairy, and Sugar may all be culprits in digestive problems. Take one of those from your diet for 30 days at a time and see how you feel. Does it make you feel better? Are you more energised? Does it help your digestion? Take the time to connect with your awesome body and see what it needs. And if you need more support then why not work with me in my private health coaching practice. Click here to book in your FREE 30 min consultation to see how I can help you feel more awesome!